At the Centre for Mindfulness Studies, we are committed to making mindfulness-based therapy more accessible for the disadvantaged and the marginalized. This is at the heart of what we do. Working with more than 20 social service agencies and 7 healthcare partners, we bring mindfulness into marginalized communities across the city of Toronto and beyond. Mental health problems disproportionately affect disadvantaged groups such as the poor, homeless, unemployed and individuals with disabilities. 32% of individuals with low incomes have problems with depression, anxiety, or other mental health problems, vs. 16% of those with higher incomes. There is a clear link between mental health and the ability to earn a living! We aim to empower people to take control of their own mental health and well-being through mindfulness-based interventions. Our therapy programs give people the tools and skills to cope with their own emotional challenges. 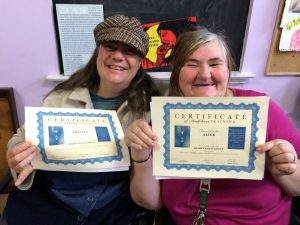 By working with groups, we also help our participants develop a sense of connection to a larger community. Our services are accessible and designed to meet the specific needs and circumstances of the populations we serve. We have taken the strategic position that the best approach is to integrate awareness and treatment capabilities into the skill-set of front-line workers in social service agencies dealing with the challenges of these communities. We train front-line workers in how to use mindfulness-based approaches to cope with their own stress. We train these workers in how to recognize the markers of mood disorders among their clients, and to become effective “first-responders” in dealing with their clients’ distress (through, for example, delivering group mindfulness therapy programs). We train client leaders, who have gone through our program, to run regular weekly practice support sessions for their peers with the objective of helping other clients develop and deepen their mindfulness skills. Through this work, we are developing “best practices” for treatment of mood disorders for communities unsuited to conventional group mindfulness programs. Our long-term objective is to move the routine treatment of mood disorders to a more cost-effective, and vastly more accessible model than the current health-care paradigm provides. In this community-based model of care, most therapy is delivered by properly trained and accredited lay workers. As well, this model integrates clients themselves into the circle of care, leveraging their lived experience and personal mindfulness skills to help other clients develop resilience and self-care, sustaining these efforts over time and lessening the need for one-on-one therapy. It is our hope that, as this model gets established in more and more organizations, continuing care provided by peers (clients) will open up opportunities for part-time employment of marginalized individuals, at a significantly lower cost than our current medical model of care.